Whether you are too tired, busy, unmotivated or just up the walls, we all have days where we just can’t make it to the gym or out and about! 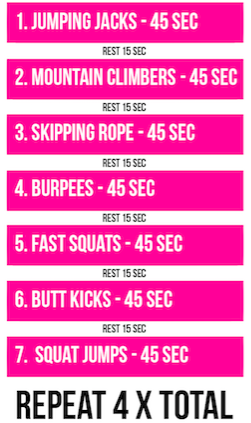 So rather than grabbing a cup of tea just yet and reaching for the biccies or glass of vino, why not give this easy peasy at-home HIIT circuit a try in the comfort of your own home, hotel room or balcony! 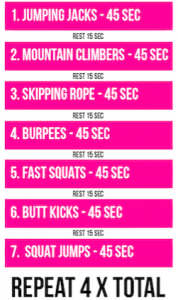 Up the intensity by simply adding another round or two- oh and don’t be afraid to get SWEATY!